To grow your plumbing business, you need marketing strategies to address both types of customer, all while competing in a crowded market. We won’t pretend there’s a one-size-fits-all solution. The good news is, you can start small and still get great results. 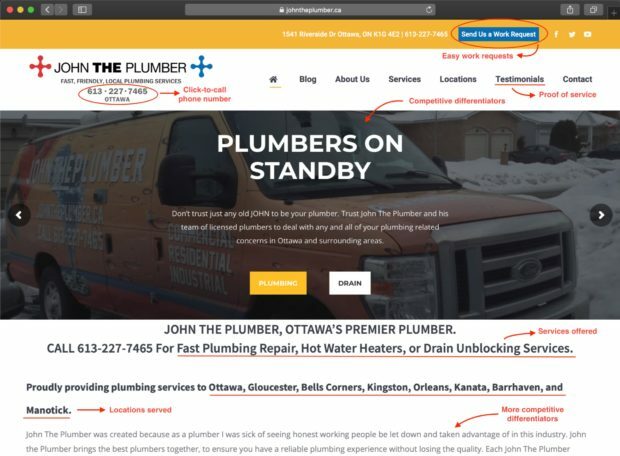 Marketing for plumbers: where to start? Even if you have zero experience with digital marketing, you can get started without hiring an expensive agency. We’ll show how these strategies can address ‘emergency market’ and the ‘researching market’ so you can grow every aspect of your plumbing business. Before we get into these strategies, let’s nail down some plumber marketing fundamentals. 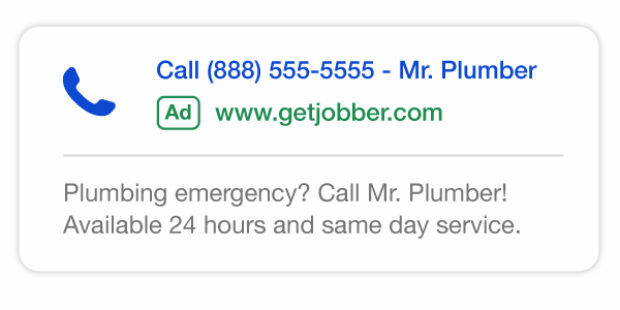 You probably didn’t start your plumbing business to sit behind a computer all day and analyze ad traffic. That’s okay, because marketing is much more than that! In fact, you probably know more about marketing than you think: coming up with you plumbing business name and logo, spreading the word to friends and family, and asking existing customers for referrals are all solid marketing practices. To get the most out of your marketing efforts, we suggest you start at the very beginning: your brand. Who is the ideal customer you are trying to reach? What statements, values, or beliefs resonate strongly with both you and your clients? How do you reflect these values in your business’ day-to-day? This exercise will help you get started in understanding and defining your brand. Now that you’ve got the fundamentals down, let’s start building your online marketing so you can attract more customers. In the case of the ‘emergency market,’ the opportunity is immediate. Whether it’s a burst pipe, broken water line, or sewer backup, your customer is looking for the nearest plumber with a good reputation who can get there in a hurry. They’re influenced by top internet search results, positive reviews, and someone they get on the phone right away. Search engines such as Google are the first place emergency call-in customers will go to find help. If you want them to find you, you need to set up your Google my Business listing. Setting up your local listing is easy—all you need is your company name, address, and contact info. For step-by-step instructions on how to do this, see our article on setting up your Google Business listing. Step two to being found online is to beef up your online presence. A professional-looking website will increase your visibility and credibility to help you get more leads. If you’ve never created a website before, fear not. There are many free or inexpensive tools you can use, such as Wix or WordPress for website creation, and Looka or Canva for professional logo design. A professional Facebook page is another way to be found fast. Of all the social media platforms, Facebook has the most users and the most conversion-friendly features. Plus, it’s free and easy to set up. Here’s how to optimize your plumbing business Facebook page to get more leads. By now, your web presence should be pretty strong, with a Google Business listing, website, and Facebook page. 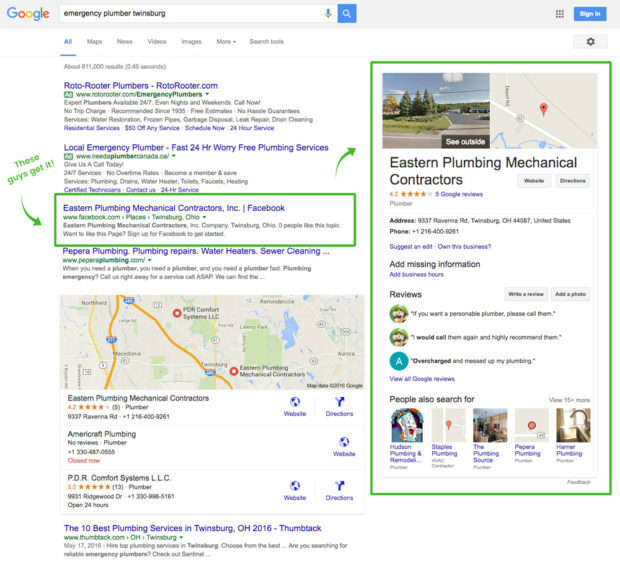 If you’d like to learn even more about search engine optimization, check out our guide to being found on Google, which is full of great examples for plumbing businesses like yours. Positive online reviews are crucial to growing your plumbing business. You’re entering your customers’ home or business, after all, and often in unpleasant or stressful situations. Before they buy from you, they need to trust you. Send your customers follow-up email after a job is complete. You can let them know the work is done and, while your there, ask for feedback. If the feedback is positive, send a polite request for a review with a link to your Google Business or Facebook page. Most people will leave a review if you just ask! Put yourself in your emergency customer’s shoes. They don’t have time to research or fill out web forms—they want to speak to a real person who can help them now. If you’re ready to start advertising, try using call-only online ad campaigns. These ads show up only on people’s smartphones and offer direct click-to-call functionality. This is a simple way to target your ad spend straight at the emergency call-out customer at the exact moment they need your services. The above-mentioned marketing strategies will help you grow your plumbing business with all types of customers, especially those in need of emergency plumbing help. Now, it’s time to turn to marketing strategies for non-emergency clients. These customers are likely in the market for a reliable, ‘go-to plumber’ who can help them with routine maintenance, fixture upgrades, or a bathroom installation. They can spend weeks or even months researching websites, reviews, service page and videos to educate themselves and find the best plumber for the job. “In 2018, don’t be an estimator or order taker. Be an educator.” That’s solid advice from Stanley Genadek of Dirt Monkey University in our 2018 Plumbing Industry Trends report. Plumbing is a specialized industry, and most consumers don’t know much—if anything—about it. Help your market feel educated and empowered, and you’ll win their trust and their business. This type of marketing strategy is known as content marketing, and the goal is to create interesting, shareable content– such as blogs, short Instagram videos, or Youtube videos — that position you as an expert and keep your services top-of-mind for prospective customers. Start by writing what you know best. For example, “The top 5 common misconceptions about plumbing”, “Common DIY plumbing mistakes and how to fix them,” or “What makes [your business name] different.” If writing isn’t your strong suit, record a simple video with your laptop or smartphone. Videos are a great way to engage your audience, and you can use them across your website, social media, and even in paid ads. It’s important to note that content marketing takes time. A homeowner wanting a new bathroom may spend months in the planning and research stage. To earn their business with this strategy, you have to earn their trust by providing branded knowledge that will make you front-of-mind when they finally do get around to asking for a quote or selecting a vendor. Learn more about content marketing for field services here. Unlike emergency customers who want to talk to a plumber right away, the research-phase customer will probably want to send a brief description of their project and find out if you can help. In order to win their business, you need a system to respond quickly and professionally to these requests. Emails aren’t a very good option because it’s easy for them to be lost in your busy inbox or sent to spam. Instead, give your customers the option to create a work request right from your website or social media page. Work requests keep all of your incoming business in one centralized CRM, so you can easily review, follow-up, and close the deal. Advertising and social media are pieces of the marketing puzzle. But excellent customer service is by far the most effective, cost-efficient, and long-term growth strategy for any plumbing business. You’ll earn repeat business, which is cheaper and more valuable in the long run, because you’ve already done the hard work getting their attention and gaining their trust. Happy customers will spread the word and send personal referrals. To use customer service as a marketing tool, start by being a great communicator. Sending a simple “on my way” text message or reminder to leave the door unlocked can go a long way towards making your visit smooth and successful. During the job, take detailed notes and photos that relate to the job and the client. If the client has questions at a later date or wants to request more service, they’ll be impressed with how much you remember and how easy it is to work with you. Don’t try doing this on pen and paper, though. We recommend using a CRM so you can track all that information in one place. Finally, after the job, send a simple follow-up email to ask for feedback, referrals, or reviews. Word of mouth referrals are so powerful, Park Lane Plumbing considers them their top marketing channel! Whether you’re the local incumbent, or the new kid on the block looking to break through as the ‘go-to plumber’, there is a market niche out there you can reach with online marketing. Figure out what’s unique about your company and make sure your messaging and tactics talk to your target market. Spend a little time each week to make yourself a better marketer, and you’ll do well. Editor’s note: this post has been updated for accuracy and to include the latest marketing tactics. Find out how Jobber can help. Quote, schedule, invoice, and get paid—faster!